Great news to all the Shopaholics! 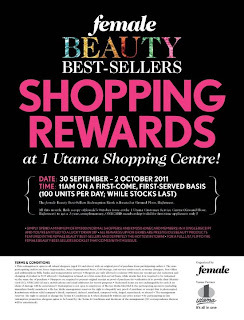 Join us at our Beauty Best-Sellers 2011 SHOPPING REWARDS happening on this Friday to Sunday at 1 Utama Shopping Centre! The Redemption Kiosk is located at Ground Floor, Highstreet. Simply spend a minimum of RM300 (normal shoppers) and RM250 (ONECARD members) in a single receipt and you’re entitled to a lucky draw dip*. All rewards up for grabs are prestigious beauty products featured in the female Beauty Best-Sellers booklet in Oct issue and definitely the hottest in town! 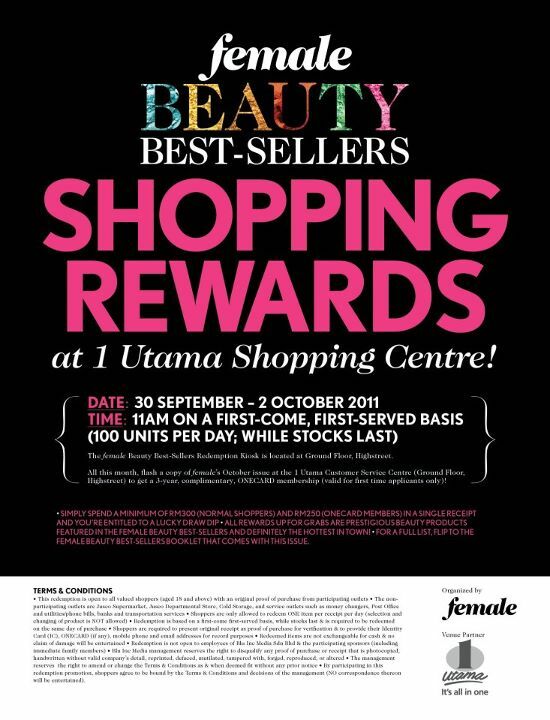 Also, for the month of Oct, readers will get a 3-year, complimentary, ONECARD membership when they flash a copy of female’s October issue to the 1 Utama Customer Service Centre (valid for first time applicants only).